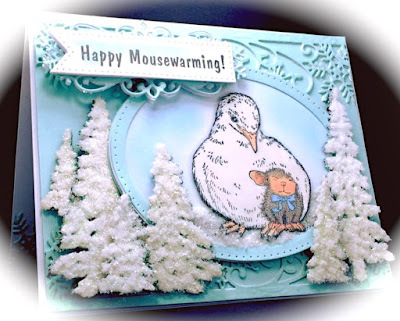 Cards by America: Happy Mouse Warming! Hello and Happy Tuesday! Hope you are doing well and starting the year off great while finding some time to craft! I've created a House-Mouse Card for the NEW "Winter Sports / Winter Fun" themed challenge over at HMFMC. Come check us out for loads of amazing inspiration from the mega talented House-Mouse Design Team and enter a project for your chance to win a fabulous prize from Simon Says Stamp. Find all the details HERE. I love how the tree have turned out. These trees are die-cut, multi-layered for dimension adhesive sprayed and multi-Glitter sprinkled for texture. The background was lined with the Snowflake Border Die. The top image panel is framed using the ovals from the "Peeking Snowflake" die. What do you think? We are Proudly Sponsored by Heidi and Simon Says Stamp!! Splitcoaststampers - Dirty Dozen Dec - Central Theme "All Bundled Up"
We cant wait to see your takes on the "Winter Sports / Winter FUN" theme at HMFMC! For more inspiration from our fabulous Mousey Team, check us out HERE. Thanks for stopping by today. I love hearing from you! Stunning! Absolutely gorgeous. Love every little detail. Way to go, Teamie! Hi America, What a beautiful card. Such a sweet image. p.s. I have started doing a House mouse card a day over on my blog, for a whole year. Feel free to take a look. WOW America this is STUNNING!! I love the trees...that sentiment is adorable!! Your image is absolutely gorgeous!!! Wishing you and yours a most wonderful and fabulous New Year! Lovely card, the littered trees are especially good. Such a super cute winter scene you have made America....love your trees- gorgeous! So cute! Love those frosty trees! WOW!! This is a fabulous winter scene!!! Love how those trees look loaded with snow! Such a beautiful card to go with this sweet image.Just love the layering and die cuts.The trees look wonderful.Thanks for joining us at Craft Your Passion.Hope to see you again next week. Adorable image and I love how you've done your trees, they're stunning.